If you feel like you have reached your maximum potential and can't find a way to improve yourself, getting coaching is the best way to solve that problem. You can purchase as many hours as you need and we will provide you with one of our finest coaches. Once you purchase, please put a note of your available times. There is a blue live chat window at the bottom right corner of the website which you can use to specifically speak to your coach. There you will be able to set a starting time and select your way of communicating as well as discuss what you are expecting from the services. Can I ask the coach to teach me specific things about the game? Yes, of course. Coaches prefer when you know what you want to learn it makes it easier for them to focus on those problems. Once a coach is assigned to you can ask him what you want to learn. We will compromise with you and get the best coach that fits you and your timetable. Our Coaches have a lot of free time and therefore they are flexible in scheduling with you. If you have some wish for specific timeframes - feel free to leave them in checkout note field. Dota 2 offers players a whole new level of online gaming experience. With its captivating graphics and ability to allow players to go beyond their wildest imaginations and come up with plans on how to battle it out with their opponents, the game ranks highly as a favorite among gamers. The game allows players to choose characters and let these characters fight against others on an online battle arena where they are required to create, occupy, and defend their separate bases on the map. Players fancy the game as they are allowed to play matches by creating two teams consisting of 5 players each. The teams then go on to create, occupy, and defend their bases on the map upon which every player independently controls a character referred to as a “hero”. These special characters boast of unique abilities and have unique styles of play. When playing, players are required to collect various items and gain points for their heroes in order to successfully tackle their opponents in player-versus-player combats. Your team will only win if it’s the first to destroy a large structure that’s located in your opponent’s base famously called the “Ancient”. Ranking as one of the best multiplayer online battle arena (MOBA) video games ever developed, Dota 2 is a captivating and intriguing game worth playing. Each level offers a new challenge and will surely hook you up. Here’s why you should try it out. It’s fun and addictive to play Dota 2. With a fascinating and intriguing gameplay doubling up with superb graphics, Dota 2 offers gamers a whole new gaming experience. The game’s developer, Valve Corporation, spent a huge amount of time and resources to develop the game, ensuring that you will be glued to your screen throughout the game. With over 110 heroes to pick, you will surely be spoilt with a long list of character choices. With this advantage, every game presents you with something new as the Meta is always changing, meaning you won't get bored while playing. Choose different characters for the different levels. If you ever get tired of finishing the game in a particular manner, there can be endless possibilities to finish the game. With this, you are always free to break the monotony and put your thinking to the test. The game is flexible enough to be completed in different ways. Not only does the game offer endless possibilities to end the game, but it also offers individual options within the game itself. The itemization, talents, builds, and lanes are only some of the most interesting options offered in the game. You can go through the game with so much ease, and that’s all thanks to its user-friendly interface. Instructions are also easily accessible, enabling you and your team members to challenge with so much ease.Despite the learning curve being tremendously steep, the game is equally rewarding. Many gamers have had differing opinions about the difficulty of the game, and this is so because some players have argued that they have found the game to be somehow difficult. This cannot be entirely true because not only do you learn and discover the intricacies of the game such as denying, what hero to choose and what each of the 85+ heroes are capable of, but you also get the chance to amass yourself to the pleasures of the game. Why Get a Dota 2 Coaching? 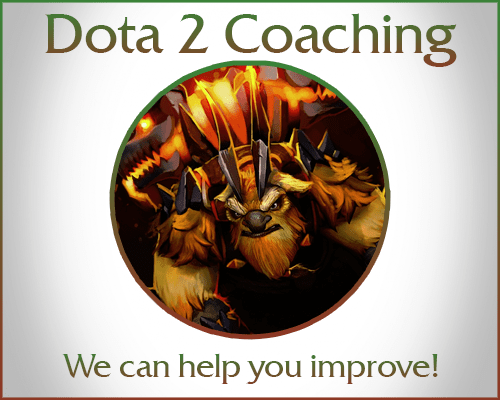 Getting Dota 2 coaching is really important especially when it comes to enhancing and improving your game. Players who find it hard to maneuver the game will really fancy Dota 2 coaching as a Dota 2 coach will assist you by guiding you and giving you the valuable gaming skills on how to tackle and defeat your opponents. Remember the aim of the game is for you to not only defend your base on the map but also try and successfully battle your opposing team’s heroes. With this, you’ll definitely appreciate the support and coaching of a Dota 2 coach. When playing you will discover that the game is highly competitive and the team that shows resilience and one that is adequately equipped with the best "technical" aspects and knowledge of the game will always have an upper hand on the different stages of the game. It is for this reason that your team desperately needs the guidance of a Dota 2 coach. Dota 2 coaches are tasked to improve the quality of your game and help you tackle the difficult hurdles that you will encounter during the game, thus giving you the platform to totally take control of your “enemies” as a team. Remember, it’s a battle of wits. For players who want to understand the game better, learn a few new tricks and discover secret hints, get the services of a Dota 2 coach and get the opportunity to achieve your goals and improve the way you play. Different players have different gaming potentials and needs. ProBoosting understands this and this is why it strives to ensure that it caters to the needs of all players alike. You are now in a position to purchase as many hours as you deem fit in order to improve your skills with ProBoosting. Feel guaranteed that ProBoosting will link you up with a coach who will help you acquire new techniques and skills to improve your game both as a player and as a member of your team. With ProBoosting, you will get an optimized gameplay together with a coach who fits the description of your play. What's even more interesting is the ease of communication you will have with your coach through the website. All you need to do is to chat with your coach directly through a user-friendly chat field that's on the website. It's also possible to plan with your coach on what you want to specifically be coached on. Remember that with ProBoosting, you are offered a safety guarantee, meaning that every single information that you share with ProBoosting is safe. ProBoosting offers a wide range of payment methods, and you have all the freedom to choose one that suits you best. Because of this and more, ProBoosting is simply the best option.